CAPACITIVE TOUCH KEYS - Capacitance is the ability of a person to hold an electrical charge, so Cardinals 190 unique capacitive touch keys allow the front of the panel to be constructed as a single piece. The keypad senses the operators finger from the inside of the enclosure. There are no moving parts to wear out or exposed electronics. Red status lamps above each key provide a visual indication of keypresses, as shown here. ULTRA-TOUGH ENCLOSURE - The combination of the rugged polycarbonate enclosure and capacitive touch keys provide total protection from sharp objects. The 190 is impact resistant for ultimate durability in harsh environments. The IP69K watertight, highly-durable enclosure provides you with the assurance of dependability that you require. COLORZONE CHECKWEIGHING - ColorZONE is the solution for efficient time management during your checkweighing processes. The bright, vivid display, changes color automatically as the preassigned target weights are reached. You know immediately when you’ve hit the acceptable weight range. The 190 STORM displays amber for under weight, green for accepted weights, and bright red when weights exceed the upper weight limit. 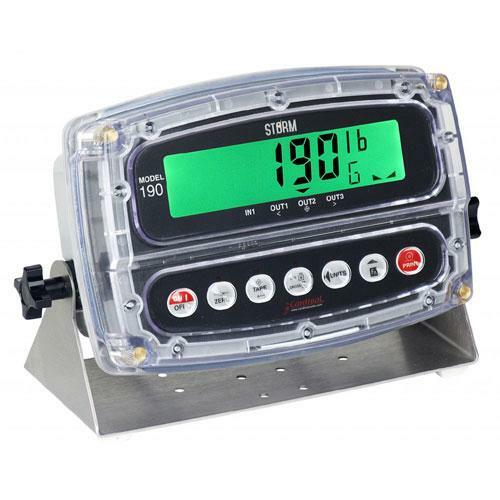 The target weights are easy to assign through the 190’s capacitive touch keypad and can be changed quickly as different sized products are weighed. IP69K - With an IP69K rating, the 190s enclosure is designed for high pressure water jet cleaning (1450PSI) at high temperatures of up to 176º F / 80º C.